These baked strawberry yogurt donuts come together quickly and are loaded with freeze-dried strawberries (or sub with fresh when in season). Why freeze-dried as opposed to fresh? They are so much sweeter, so there is no need for much else in the way of sweeteners, plus it means you can make them all year round, rather than waiting for strawberries to come into season. Huge plus. Especially if you have little strawberry lovers in the house. I haven’t had a sweet recipe on here in F-O-R-E-V-E-R!! I really don’t know how that is possible given my penchant for sweet foods, but here we are. Don’t worry, I plan on redeeming myself with these easy and more-ish baked strawberry yogurt donuts. If you don’t have a donut pan, they work just as well as muffins (my preschooler will attest to this as he just had to bring them in for snack at school, and there was no way I was making 24 full-sized donuts, so mini muffins it was). You will just have to adjust the cooking time a wee bit. Approx 15 mins for mini muffins and 20-22 mins for regular size. Be sure to stick them with a skewer and make sure it comes out clean and dry, indicating readiness. If it comes out with wet food stuck to it, then pop them in for a bit longer. I don’t tend to glaze my homemade donuts, they are treat enough in my books. However this weekend the kids requested a glaze, and seeing as they were especially well-behaved (nothing to do with behavior, they slept through the night, and my God I needed a proper sleep), I decided to just go with it. I used this recipe from Chocolate Covered Katie and it went down a treat (pun intended). If you aren’t into using xylitol, or its hard to find in your neck of the woods, you can just make a simple glaze with 1/3 cup powdered sugar (I found a great organic one at Whole Foods), 1/2 teaspoon vanilla extract and 1 to 3 teaspoons milk mixed together until thin enough to drizzle. I then crush a little bit more freeze-dried strawberries on top just because it looks pretty. 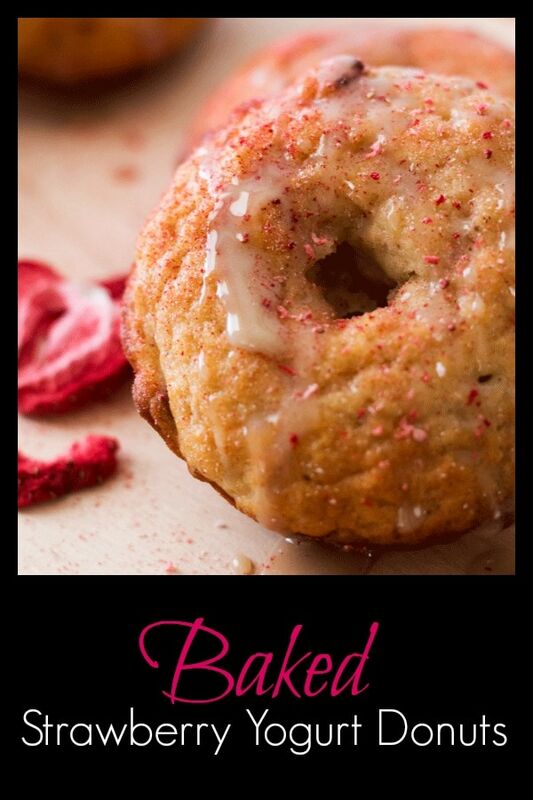 I just love hearing from you, so if you happen to try out these baked strawberry and yogurt donuts then be sure to pop back and let me know what you think!! Happy eating. 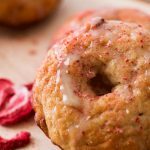 These baked strawberry yogurt donuts come together quickly and are loaded with freeze dried strawberries. Why freeze dried as opposed to fresh? They are so much sweeter, so there is no need for much else in the way of sweeteners, plus it means you can make them all year round, rather than waiting for strawberries to come into season. Huge plus. Especially if you have little strawberry lovers in the house. In a large mixing bowl, whisk the flour, coconut sugar, baking powder, baking soda, cinnamon, and salt until well blended. In another bowl, whisk the vanilla, yogurt, egg, and melted butter until smooth. Pour into the bowl with flour and stir with a fork until just combined. Do not over mix. Stir in the freeze-dried strawberries. Fill donut cups about three-quarters full. Bake donuts until tops are golden brown, no longer wet and a toothpick inserted into the middle comes out with crumbs, not wet batter; 15 to 20 minutes. Transfer to a wire rack and cool completely. Serve and enjoy. Oh wow were these baked strawberry yogurt donuts awesome! Next time around I’m baking up a double batch of this tasty goodness!